How do you help settle a nervous horse in-hand? 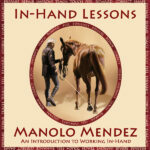 This is a question Manolo is often asked in the group we set up for the riders who are studying his training approach and his in-hand work. To help answer it, we cut a clip from footage we had from Equitana where Clint was part of a three day educational in Nov 2012. This was shot on Day 1 as her arrived into the arena and he was quite worried about the crowd and the new experience. We added narration to explain what and why Manolo is doing and decided to share it with everyone rather then restrict it to our FB In-Hand Group. Make sure to read the text beneath the video clip which recaps the progression in the horses’ condition from highly anxious to settled. Helping the nervous horse settle.